The Blue Ridge Assembly Historic District is nestled in a beautiful cove between two heavily forested ridges of the Swannanoa Mountains, a range of the Blue Ridge Mountains in western North Carolina. The Assembly area is bordered by two swiftly flowing creeks that run parallel to each other. From this site, one has incomparable views of the Craggy and Black Mountain ranges to the north. 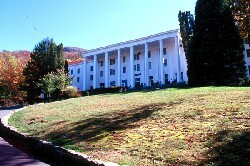 Blue Ridge Assembly was founded in 1912, due largely to the efforts of Willis Duke Weatherford, author and humanitarian. 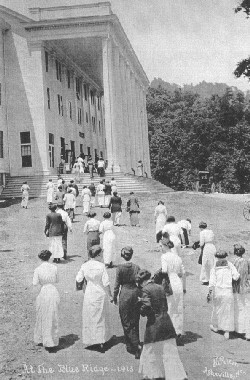 Established as a training ground in religious education for the YMCA and many other organizations, the Assembly became one of the area's most important conference centers, assembly grounds and religious retreats at a time when Western North Carolina was gaining attention as a retreat mecca. It played a crucial role in the area's economic, educational and cultural development. The historical core of the Blue Ridge Assembly Historic District consists of a large and impressive group of Colonial and Neoclassical buildings constructed between 1912 and 1930. Designed by Louis Jallade of New York, the most dominant building is Robert E. Lee Hall, a large three-story frame building with an octastyle portico rising its full height. Flanking this imposing hall are four porticoed, two-story frame buildings forming a large informal courtyard. Behind this group is a series of 19 cottages, most with porches and stone detail, arranged irregularly on serpentine access roads that are informally landscaped with flowering trees and shrubs indigenous to the area. Black Mountain College, famed for its immense contributions to progressive, innovative education, modern art and literature, was established here in 1933, but moved to its own location in 1941. Today, the Assembly is the second oldest conference center in the North Carolina Mountains and continues to serve the southeast as a hub for religious and educational activities. Blue Ridge Assembly Historic District is located three miles southwest of Black Mountain on Blue Ridge Assembly Rd., 15 miles east of Asheville. It is not open to the public. For more information call 828-669-8422 or visit the Assembly's website.